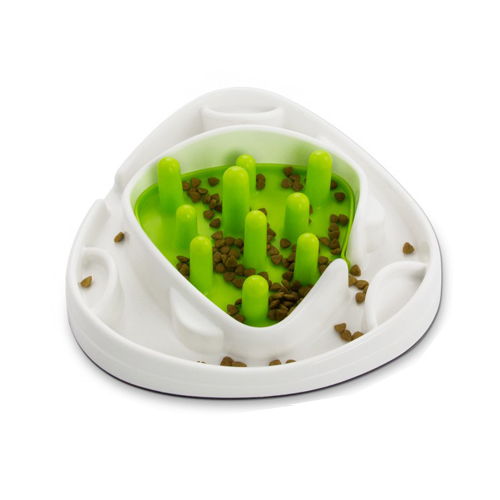 AFP Interactive Food Maze is a convenient and challenging food bowl for dogs that prevents them from eating too fast. The Food Maze is suitable for all dogs, except for extremely short-nosed dogs. The convenient Interactive Food Maze by AFP can help prevent your dog eating too fast. The maze challenges your dog to find the best way of retrieving the kibble in whichever way works, using their paws, tongue, nose or anything else. This will noticeable slow down your dog's eating habits. Dogs that eat too quickly can suffer from health problems such as gastric dilatation volvulus, more commonly known as a twisted stomach. This disorder occurs most commonly in larger dog breeds. Dogs that eat too quickly also have a tendency of eating too much, which can lead to them becoming overweight, or even obese. Dogs that are overweight, in turn, have a higher risk of contracting heart disease, heat stroke and problems with their airways. In short, eating slowly in a natural way will lessen the risk of other major health problems. Have you used AFP Interactive Food Maze before? Let us know what you think about this product. This is a great idea. I would recommend it for dogs that have a difficult time chewing and gulp a lot!